Description: Also known as Tree Cholla, Candelabra Cactus, and Walkingstick Cholla, the Cane Cholla is the largest native cactus at Chimney Rock. Chimney Rock’s large and showy cholla bloom in pink or yellow after the summer solstice. The bright yellow fruits are also quite beautiful as well as spineless and remain on the cactus all winter. These rangy plants have thick, fleshy stems with grooves that hint at the woody skeleton underneath. The numerous petals give the flower a look like old-world roses. Plants can be up to 30 inches high. Where to look: Look for these spectacular plants in the area between the upper and lower parking lots. – Woody stems may have been used for walking sticks or small cages or stockades. – Hopis boiled the fruit with squash as a food. 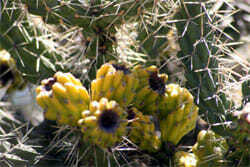 – Zuni ate cholla fruit raw or stewed or dried and ground into flour. – The Hopi drank a tea (with globe mallow) for diarrhea. 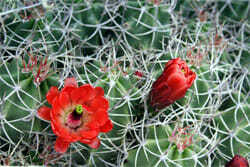 Description: Of the five cactus species that occur at Chimney Rock, the Claret-Cup is perhaps the most beautiful. 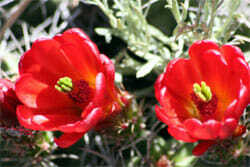 The bright, cardinal-red flowers are shaped like small wineglasses, 2 inches across, appearing in late May to June. The mound of hedgehog-shaped stems sports a multitude of blooms pollinated by hummingbirds. The cylindrical, ribbed, spiny stems measure 3 to 12 inches in length. Although their fruits are smaller than the Prickly Pear Cactus, they are sweeter and some consider them tastier. Many modern tribes eat them and it’s likely they were collected and eaten by the Ancestral Puebloans. Where to look: Chimney Rock’s Claret Cup cactus is on the lower side of the road about halfway from the cabin to the upper parking area. 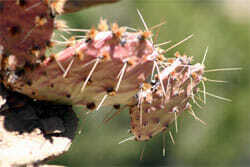 – Smaller than prickly pear, the fruits are sweeter and spines are more easily removed. – Modern-day Puebloans use the fruit to prepare cakes, candies, and preserves. – Zuni use these cacti mixed with other ingredients to make a reddish shoe polish to use on moccasins or to dye thread for weaving. – Isletans used one species to reduce swelling of sores. 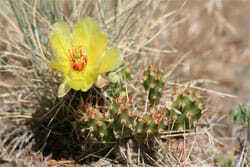 Description: This cactus is the smallest of the five species of cacti found at Chimney Rock. It has thick, spiny, low-growing jointed stems. The jointed segments (pads) are rounded, almost ball-like, and often found in clusters of up to ten balls. The pads are easily broken and their barbed spines often attach to shoes and pant legs and are carried to a new location to start a new plant when they fall off. 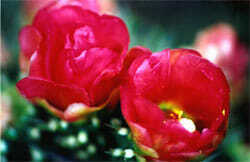 The plant is also known as the Brittle Prickly Pear and the Potato Cactus. 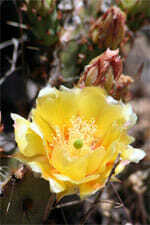 These small cacti provide a mass of showy yellow flowers in June to early July. Where to look: These small cacti appear along both the upper and lower trails but especially along the upper trail just above the upper parking lot on the High Mesa. -Puebloans ate the stems as a snack. -The Zuni used it for food. -Burn off the spines and eat the balls whole or cut in half and scoop out the flesh. 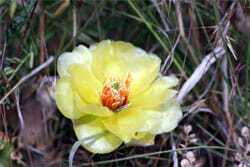 Description: From late June to late July,the prickly pear is dressed in blooms up to 3 inches across, usually yellow with reddish bases but may be rose or orange. The flowers bloom from the edge of 2 to 6 inch pads that generally reach less than 1 foot tall. This common cactus produces seeds but it also can grow roots on a pad that touches the ground. This group of cacti are well-protected by spines on the oblong pads and fruits. Where to look: Chimney Rock’s Prickly Pear Cacti live on the cliff edge at the east end of the High Mesa parking lot. -A regular dietary item for most Ancestral Puebloans. -Fruits, called tunas, are a good source of protein, Vitamin C, potassium, and calcium. -Eat pads fresh or cooked, providing a sweet treat. -Navajos removed the spines by rolling in sand or singeing in hot ashes. -The mucilaginous juice can be used to waterproof and preserve painted designs on leather. -The fermented juice makes rose to pink dyes. Description: This perennial grass grows in tufts and is endemic to (i.e. only grows in) the Rocky Mountains. The leaves are usually twisted or curled and hairy. The flowers are clustered in two short-stalked spikes which are curved and one sided. 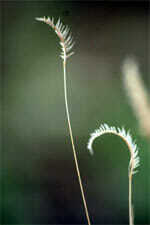 The young seed head is purplish to bluish red and curls when it dries. 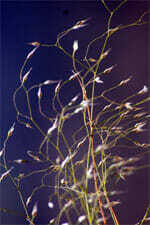 The plant spreads via underground rhizomes. Height at maturity is up to a foot tall. Where to look: This grass grows along the upper trail between the Ridge House Site and the 600-year-old dead snag. Description: One of the most common grasses at Chimney Rock and the easiest to identify, Indian Rice Grass is also known as Indian Millet. This grass grows in large clumps and produces small black seeds that mature in June, before any other grasses. Lacy and delicate, this grain was easy to harvest by Ancestral Puebloans because of its easily removed husk and open cluster of seed heads. The two bracts holding the seed are bell-shaped and remain on the stem throughout the winter. The dense clumps grow as tall as 2 feet. Where to look: Rice Grass is a common sight along the upper trail and in the plaza in front of the Great House Pueblo. -Ricegrass seeds were a staple of the Ancestral Puebloans, used to make bread, cakes, or a hot cereal. -Ricegrass is rich in protein as well as carbohydrates; an ounce of seed yields 120 calories. -Modern tribes continued to use this important plant as a part of their diet until the late 1800s. -Navajos wove the grass with yucca fibers to make clothes and bedding.